How will the economy pay for Baby Boomer retirement without more workers? As soon as we see unemployment dip down to the structural level of unemployment, that sounds fine. In the meantime, the difference is supported by institutionalized application of unfairness and exploitation. 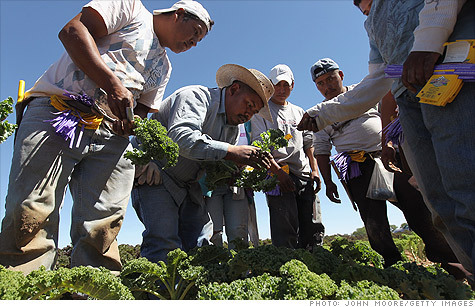 Farm visas and such shouldn't be used as a means of glutting the labor pool so as to reduce costs (i.e., artificially and unfairly spiking demand). If there is to be a cost to bringing in foreign workers (such as the depressive effect on wages more broadly), let it be borne solely by those who profit from using foreign workers. Well, you're wrong about that, and I'll be happy to work with you through direct messages to point you towards the thread were such people are professing their callous disregard. But if you're truly not in favor of discussing the more generalized poor in this forum, then do yourself a favor and not discuss the more generalized poor. I generally don't bring up tangents unless I misunderstand something someone writes, but if someone else brings tangents up I'll respond: The best way to rid the thread of discussions about the more generalized poor is for folks to stop posting about that topic. Evidently we don't, since economic inequality has doubled in a generation and there are many people still working very hard to make this nation less and less civilized, more and more callous toward those less fortunate. What we have far too many of are egoistic greed-mongers and their sycophants who are sold a promise that if they help the wealthy get richer at the expense of the poor that somehow they too will benefit, even though it does seem that most of those who support such offensively antisocial policies are actually harmed by those policies themselves, at least in the long-run. But, again, if you don't want to discuss the more generalized issue of wealth and poverty in America, then don't bring it up. And as I've indicated already, I don't have a strong opinion on the illegal immigrants aspect. However, with regard to the rest, what I see very clearly is a bunch of right-wing rhetoric that carelessly disparages and marginalizes anyone who cannot make ends meet, ascribing vacuously self-serving labels like "welfare queens" and "lazy people" without actually knowing the entirety of the people that they're ascribing such labels. The reality is that very few if any of the working poor and those struggling to find gainful employment that I've met would fall into those categories. Rather, they're victims of an increasingly unfair economic system, within which economic inequality has doubled in a generation, within which productivity and profitability has continued to skyrocket over the last ten years while wages have remained flat. It surely would help a moral person to sleep at night thinking the worst of these poor folks, as you have, but given that it is not an honest and accurate characterization of the people you're referring to, as far as those I've met, it is undeserved relief. But, again, if you don't want to discuss the more generalized issue of wealth and poverty in America, then don't bring it up. And many Americans consider that third HDTV in the bedroom to be a basic need. I haven't brought anything up, all I have done is respond to your remarks. IMO, this topic isn't an illegal immigration one and therefore I will not be participatiing in it anymore. But just one thing though I find it ironic that those who constantly flame others over their possessions and their right to keep them for themselves and spend their own hard earned money the way they see fit while still supporting the poor through their taxes don't have a valid argument. I will never make excuses for welfare queens, lazy people and illegal immigrants. I also find it hypocritical that those who flame the rich for hiring illegal immigrants to increase their profits are the same people who want their cheap, illegal slaves to remain here. I haven't brought anything up, all I have done is respond to your remarks. And all I've done is respond to your remarks and those remarks others have posted in the thread. So, in other words, you won't be participating, but you will participate, in the more generalized discussion. Okay - thanks for making that clear. I find it ironic that those who constantly flame others over their possessions and their right to keep them for themselves and spend their own hard earned money the way they see fit while still supporting the poor through their taxes don't have a valid argument. So what you're saying is that you find it "ironic" that reasonable, socially-conscious people disagree with you, and object to selfish and avaricious perspectives that you support. I will never make excuses for welfare queens, lazy people and illegal immigrants. Neither will I. Rather, I will never grant an unrebutted soapbox to those who presume to characterize those less fortunate as "welfare queens, lazy people and illegal immigrants", given that so many of those less fortunate are no such thing. I also find it hypocritical that those who flame the rich for hiring illegal immigrants to increase their profits are the same people who want their cheap, illegal slaves to remain here. Which is a remarkably vacuous comment to be directed to me, given that I've made clear in the thread my position that employers should not be allowed to pay anyone less than a fair wage - that if they want to issue farm visas (for example) that the requirement be that they pay those workers they import full American wages, so that there is absolutely no motivation to import workers except that there truly is no American available to do that work. But heck, don't let the reality of what people have said get into the way of your pointless rebuttals. Part of the reason why there are 23 million or so jobless is because the economy hasn´t grown to support it. An aging population will lead to economic stagnation and decline if we were to chose that path. That is the price of the population stability. China would completely dominate the world economy, despite their own aging population (which isn´t as nearly costly) and our influence would be substantially diminished. That is fine for many people. The real problem is that if effects quality of life. As the largest proportion of a government's expenditure is on health, social security are most used by old population. Also the increasing expenditure on pension becomes a problem too. Increased fees and taxes to sustain this will drastically reduce spending power and quality of life for many. I don´t think many young people want to work just to support the retirement of a costly generation and their government that spent all their money on superficial causes. You´d be hard pressed to find anyone under the age of 35 that thinks that should be a priority with their own employment and economic struggles. The real question that needs to be asked is why isn't anyone with a science of medical degree educated in this country immediately given a green card? Those 23 Million jobs aren´t going to be created without an influx of innovation. Maybe the real question is...why does family reunification of foreign nationals account for two thirds (66%) of legal immigration to America every year? Compare that to the rate of foreign nationals who are granted legal permanent residency (LPR) on the basis of employment skills (13%) and for humanitarian reasons (17%). Concerning the many young people who you don't think want to work just to support the retirement of a costly generation and their government that spent all their money on superficial causes...again, perhaps the real question is why has/is the American taxpayer (including the baby boomers all these many years of working, by the way) expected to pay for education, around $50 billion from local coffers and an additional $2 billion from the federal government, and a substantial portion ($8.3 billion) also going to specialized instruction for limited English speakers (and the world at large wants to proclaim how lazy and ignorant Americans are because they do not speak any language other than English) and several hundred million dollars which is spent on subsidized college tuitions...for babies born on American soil of illegal immigrants. The answer is obvious...we cannot afford to educate American born citizens in another language because we are paying to teach illegal immigrants English; yes a necessary financial evil because they are here now, no doubt about it that babies born on American soil need to learn English...and NOW they have TWO languages! Perhaps these spent monies are the superficial causes of these costly generations of anchor babies which our government has spent a portion of the baby boomers money on. Perhaps...and IF, the American government invested our tax dollars into the American schools and American education of the already here American citizens we would not have to look outside of our borders for educated and qualified individuals to fill those precious STEM positions that we are so lacking in citizenry to provide...hmmm, what do you think? Concerning your commentary of the largest proportion of a government's expenditure is on health, social security are most used by old population (<---where were you going with that?). At this point are you really interested in the medical expense to individual American states as well as the federal government? How undocumented immigrants sometimes receive medicaid treatment because of funding that has been around since the 80's to pay for stabilizing all emergency patients regardless of their insurance or citizenship status. Also, and by the way, most of that subsidy is for delivering what is believed to be tens of thousands of babies of illegal immigrants. I think you may be fooling yourself into believing that the financial woes of America are directly in proportion to the aging baby boomers as we (America) were completely on our way to the financial brink of ruin/hell and damnation long before many of the baby boomers were 30 or 40 years old my friend and I think we can attribute that to the champagne taste on a beer budget of our elected officials. Ahh, you may say to yourself...well, we, the American people elected them and you are exactly correct. That being said, it does appears to me that it has not mattered in a very long time at all who we elect because they will always have an inclination of pandering to the largest voting block who votes them in to their respective office, the lobbyists, the special interest groups out there, the military budget (if we can seriously call that a budget), and let us not forget the local politicians and their beloved pork barrel spending and a predilection...almost entitlement mentality of such an attitude and mindset. Do you want to know the real cost of your dream world of population stability? Re-read the above paragraphs, follow the referenced links below and perhaps you will be inspired to do some research of your own rather than surmise what you believe to be the problem facing America's economy regarding those no good, rotten, decrepid, and massive population of retiring baby boomers. After all, who the hell do they think they are expecting to receive what they worked for as did the generations before them received. Also and lastly, about your opinion for the reason why there are 23 million or so jobless being because the economy hasn´t grown to support it. I can tell you this much...hundreds of thousands of immigrants have gained hundreds of thousands of jobs since the Great Recession supposedly ended, while American workers lost more than a million jobs. God Bless America and I mean that from the very fabric of my being. I am ALL for legal immigration of a population of diverse individuals from ALL over this world of ours as long as they bring something of value to the table (e.g., a specialty, a degree, an ability, a gift that NO American citizen can offer to accomplish) rather than merely seeking citizenship for the sake of receiving benefits purely by the status of dropping a baby or two, or three, or four (well, you get the idea) who are then automatically granted American citizenship. P.S. Just a reminder on how we, the American people became unwittingly entwined and obligated somehow for the feeding of, education of, housing of, and health care of so many illegal immigrants. Would you and your ancestors have been able to immigrate to the U.S. under today's immigration laws? Last edited by HomeIsWhere...; 05-16-2013 at 01:27 PM..
What a great post! I so agree with you about the costs of illegal immigration, anchor babies, etc. I also agree with you about curbing this nonsense of family reunificatiions opposed to immigrants who have skills we need and won't be a burden to our society. I also whole heartedly agree with you about diversity. We have gotten away from that and that is why Ted Kennedy's claims have failed. We have plenty of workers. The problem is we don't have plenty of jobs. There is a glut of workers without jobs and another glut underemployed. But hey..let's give amnesty to 11-20 million undocumented Democrats anyway.